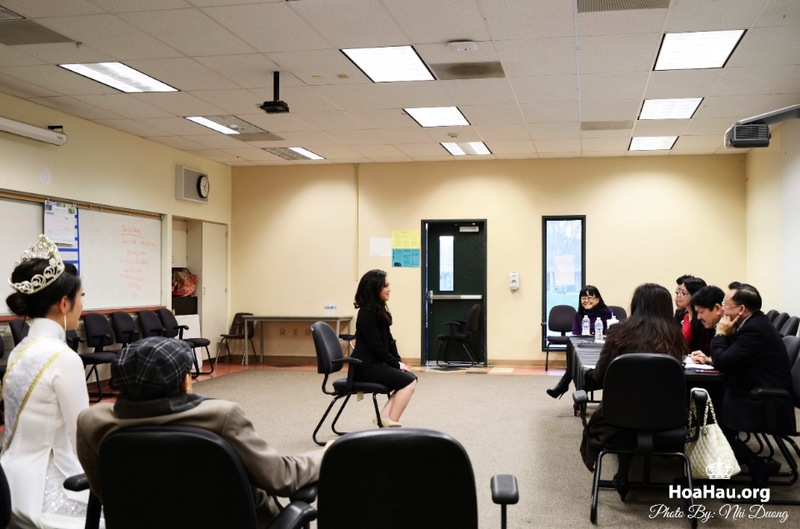 Choosing the next Hoa Hau Ao Dai Bac Cali is not an easy task, ask any former judge. They are expected to be fair, but are given very little opportunity to get to know the contestants. Meeting the contestants on the pageant day alone is never enough, so to assist the judges, a preliminary interview is arranged the day before the pageant. Every year, different judges are selected based on their merit and great contributions to society. All of them are highly respected members of their organizations and communities. In this pageant, they have two key objectives; get to know the contestants better, and provide them with the fairest ruling during competition. When meeting the judges, the contestants are advised to look their best. Although not required, business suits are generally worn. 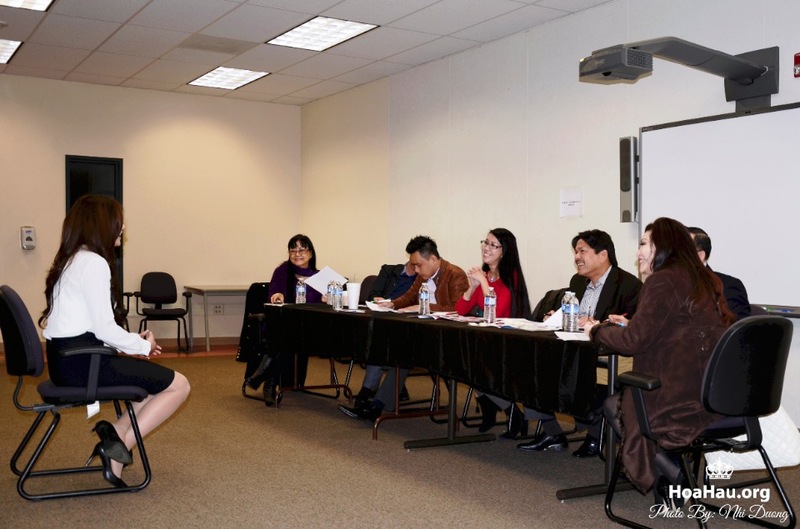 Just like job interview, making a great first impression is very important, and meeting the judges is no exception. Welcome to the interview room. This is where first impressions are made. Starting with the lowest contestant number, one by one they will get the chance to meet the judges. 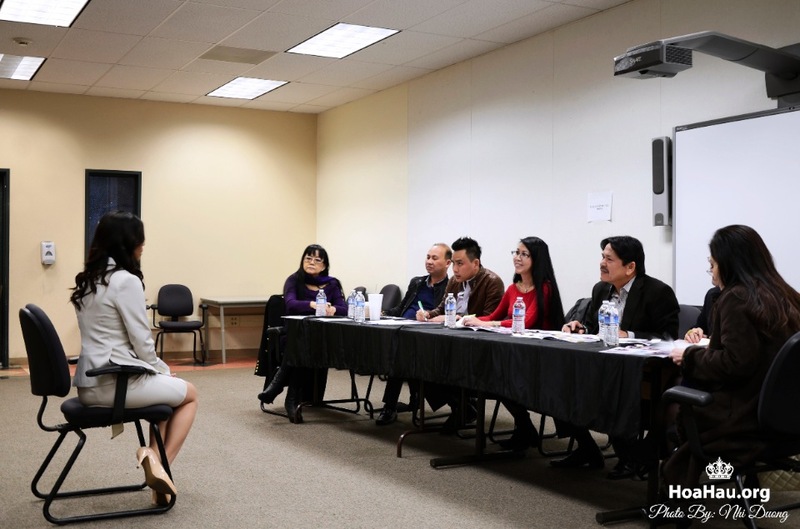 As Pham Thi Phuong Trang (Contestant #1) walks up to the judges table, she is greeted by warm, friendly smiles. Nguyen Pauline (Contestant #6) shares a few laughs with the judges. If you give the judges something to smile about, then you’re more likely stand out and be remembered, which is always a good thing. 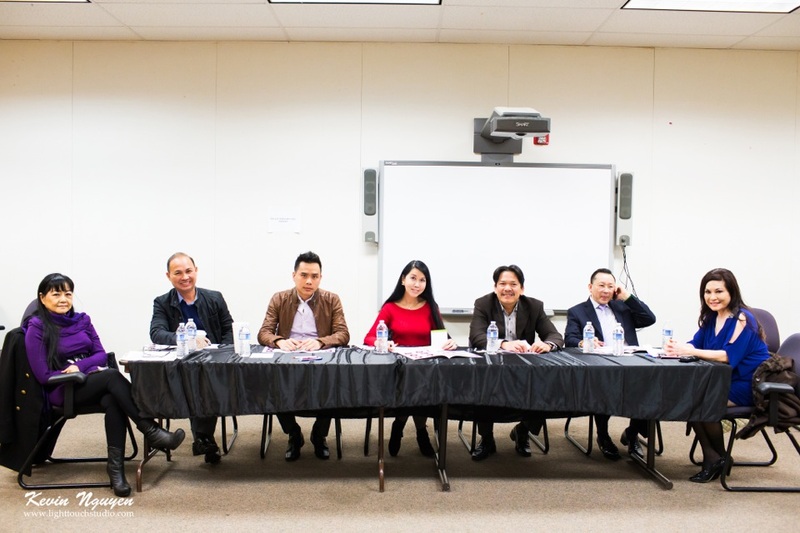 To Pauline’s far right, is the reigning Hoa Hau Ao Dai Bac Cali 2012, Nguyen Quynh Phuong and Mr. An Vu (the pageant’s founder and producer for the past 26 years!). They both observe passively and quietly, while the judges do all of the interviewing. Outside the closed doors of the interview room, sit the other awaiting contestants. As a courtesy to the current interviewing contestant, the other contestants may not listen in. Here, they sit patiently in one of the corridors outside the interviewing area. 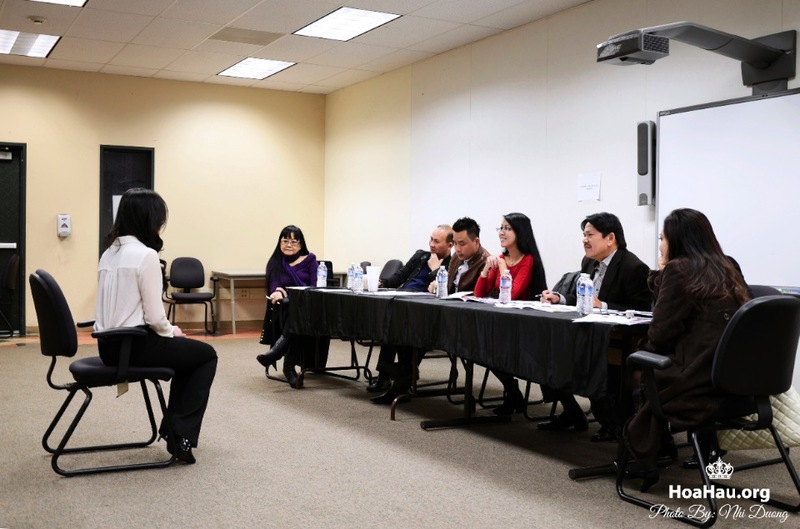 Queenie Huyen Tran (the pageant’s long time founder/producer/emcee) gives last minute tips and advice. There is nothing wrong with easing the tension and anxiety by posing for a few pictures. These lovely ladies look as though they’ve got all the confidence they need to face the judges. The alluring lady in blue is Duong Gia Le (Contestant #5). 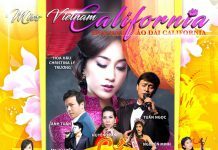 In place of where Nguyen Quynh Phuong (Hoa Hau Ao Dai Bac Cali 2012) was sitting is Le Tran (A-Hau 2012) and Mr. An Vu. They’re still just passive observers while the judges do all the questioning. Ly Hong Yen Yvonne (Contestant #8) sits patiently while the judges ask their next question. Ly Hong Yen Yvonne (Contestant #8) chose a very captivating blue/green blouse to wear to the interview. 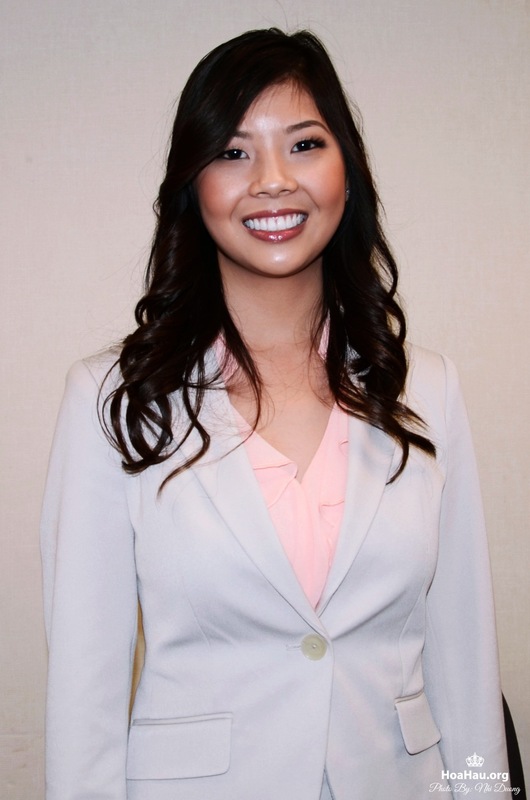 Truong Hoang Phung (Contestant #11) is our young lawyer. When Truong Hoang Phung (Contestant #11) smiles, you’ll probably need to put on your shades. With her pearly whites, she could also be a dental model. Meeting the judges can be scary because you don’t know what to expect. Like many of her peers, Vu Thi Anh Thu (Contestant #15) was very nervous, but the judges understood and commended her for her bravery and sincerity. 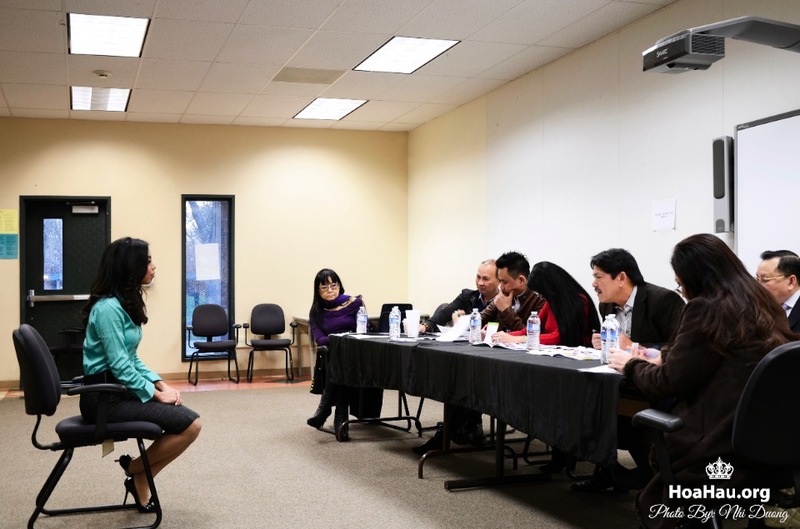 Tran Le Nguyen Minh (Contestant #12) impressed the judges with her fluent Vietnamese. Tran Le Nguyen Minh (Contestant #12) is our Korean movie star look-alike. Wouldn’t you agree? 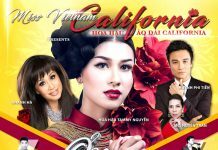 What makes her special is that she has not only one or two, but THREE of the most common Vietnamese last names within her name. 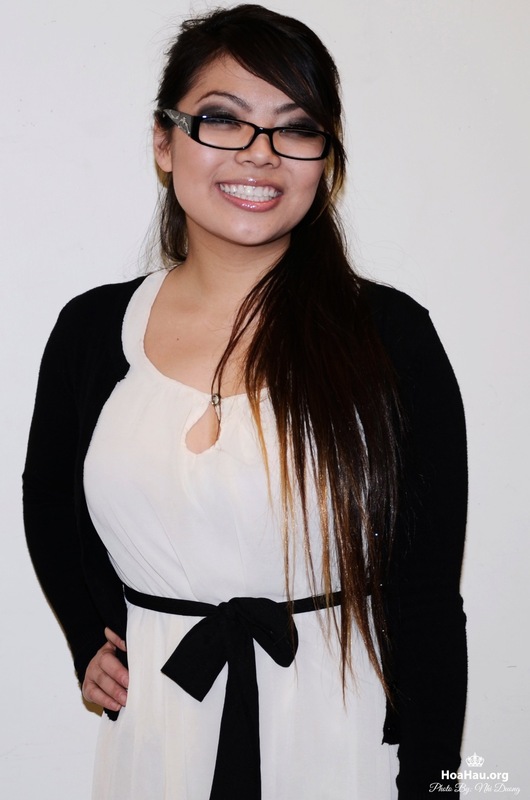 The last contestant to interview is Nguyen Diem Sandy (Contestant #18). She’s the Japanese-Idol look-alike. 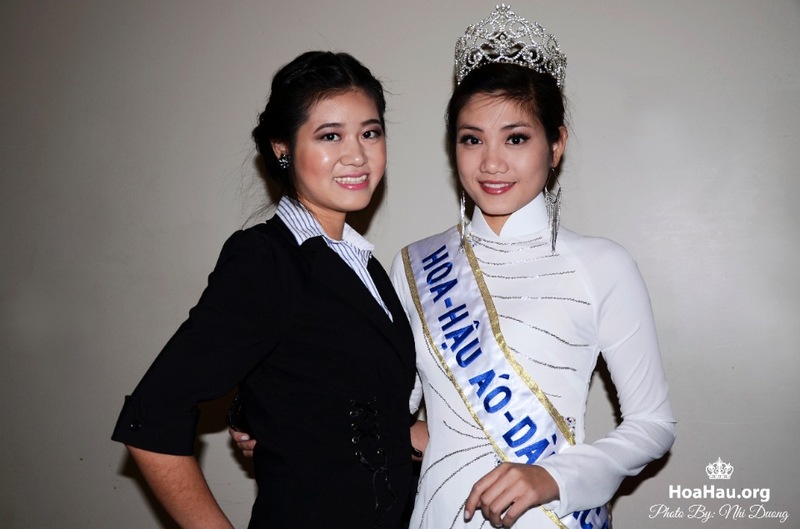 She’s only 18 years old and is one of the two youngest contestants in this year’s Hoa Hau Ao Dai Bac Cali pageant. As the interview came to an end, the contestants were all invited back into the room to take a group photo with all the judges. Hoa Hau Ao Dai Bac Cali 2012, Nguyen Quynh Phuong, stood in the middle. You can’t miss her because she has on a crown, shash and the white ao-dai. Kevin Nguyen was there to take photos for the ladies, but this photo was copped in the name of candidness. Mr. An Vu An has nothing but kind words and understanding for these girls. Mr. An Vu, as he has been frequently called “chu An” by all the girls, has always been the fatherly figure in this pageant. He’s very soft spoken and kind, just like a father would be. Katherine and Queenie joined the photo shoot. In this pageant, you can make a lot of everlasting friendships. The two best friends: Doan Thuy Tien (Contestant #9) and Tran Le Nguyen Minh (Contestant #12) have found comfort in each other’s company throughout this endeavoring voyage. And look… how cute! They even have on matching outfits and curly long hair. Doan Thuy Tien (Contestant #9) and Tran Le Nguyen Minh (Contestant #12) make white shirts and black pants look very stylish. Less is definitely more. 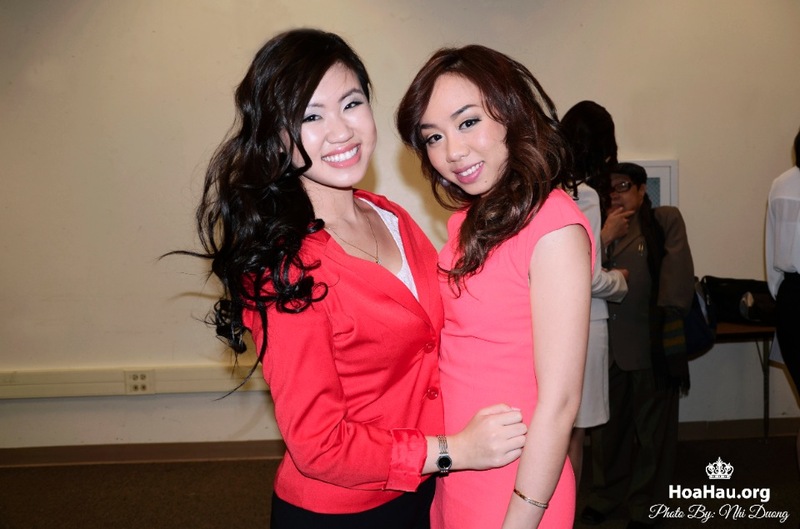 Wearing the two prettiest shades of red are Nguyen Huyen Tran Christine (Contestant #4) and Nguyen Thanh Thao (Contestant #2). The lower numbered contestants lined up in front of the judges for a final glimpse. As you can see this is the colorful group. The higher numbered contestants also lined up for the judges to have a final look. In hotels, it’s not uncommon not to find floor number 13 because it’s unlucky to some. In this pageant, you won’t likely find contestant number 13 and 14 (well, not anymore). Those two numbers have been purposely omitted due to the stigma attached to them. 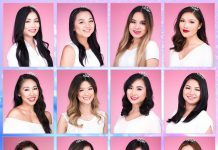 While the pageant committee is not entirely superstitious, they have changed the numbering system to accommodate the contestants who might be a little concerned that those two numbers are unfavorable. 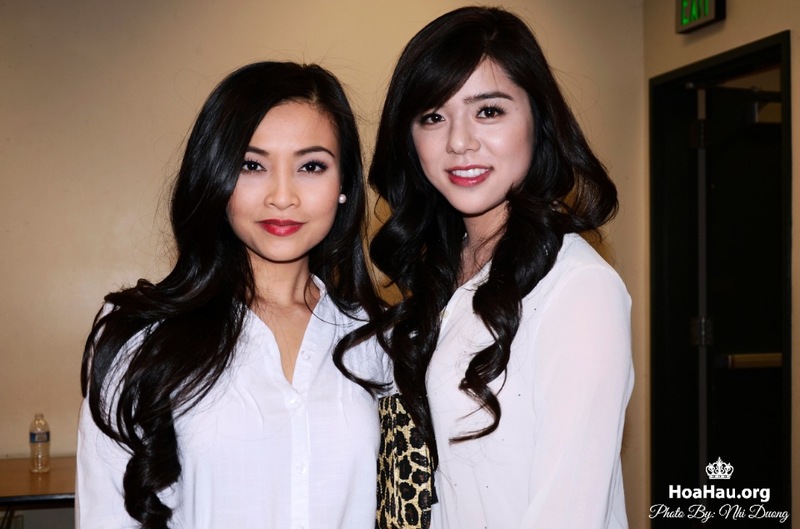 Nguyen Pauline (Contestant #6) and Hua Kim Yen Yvonne (Contestant #10). Vuong Thanh Phuong Uyen Jennifer (Contestant #7) looks fabulous in this mute, monochromatic outfit. Group photo! As you can see, the girls have got their poses down. Another group photo! Looks like one of the contestants wasn’t ready. Oops! 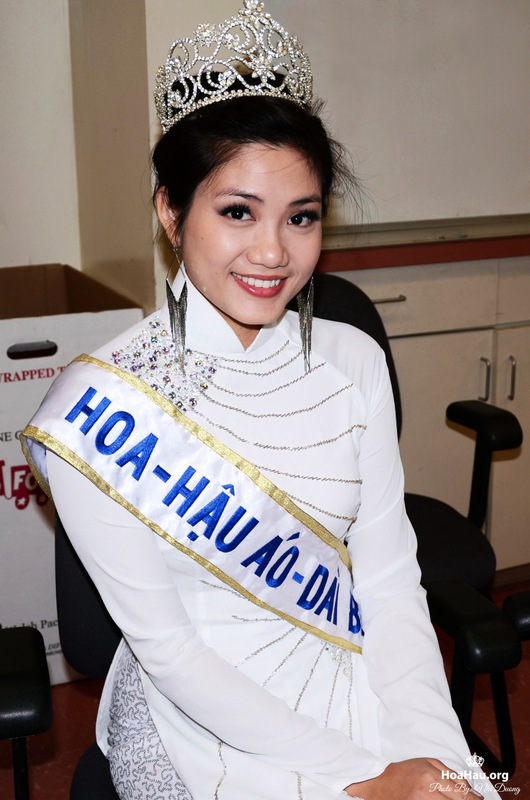 The always helpful and very hard working, Linda Tran (Hoa Hau Ao Dai Bac Cali 2008), is this year’s pageant director. 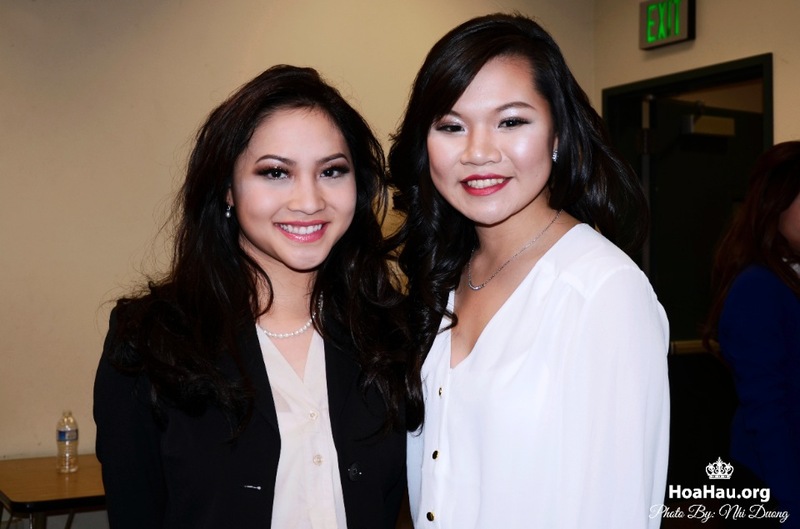 Tran Vu Phuong Hoang (Contestant #16) and the reigning Hoa Hau Ao Dai Bac Cali 2012, Nguyen Quynh Phuong. Hoa Hau Ao Dai Bac Cali 2012, Nguyen Quynh Phuong smiled for the camera. There is nothing better than having your family by your side. Nguyen Diem Sandy (Contestant #18) and her very supportive mother. They drove all the way from San Francisco to attend this pageant. Absolutely precious!